I picked this up today and a fellow collector tells me its a post war snipers badge, only used for 3 or 4 years. I am not a badge collector so maybe you guys can tell me the truth about it. It cost me $2 so I figured I'd buy it and see if he was right. Try marksman's badge/best shot, in this colour for rifles regiments. It was used as a "prize" badge for best shot in a platoon, section etc. King's crown pattern was around from before the First World War, but this type is either Second World War/post war. It was worth the $2 for the story. I had one of those on my uniform when I was in the infantry, except with a Queen's crown of course. On the current DEU's it is worn in the army to signify that a soldier has achieved marksman level on the annual personal weapons test (PWT). Bill wrote: Try marksman's badge/best shot, in this colour for rifles regiments. It was used as a "prize" badge for best shot in a platoon, section etc. King's crown pattern was around from before the First World War, but this type is either Second World War/post war. It was worth the $2 for the story. 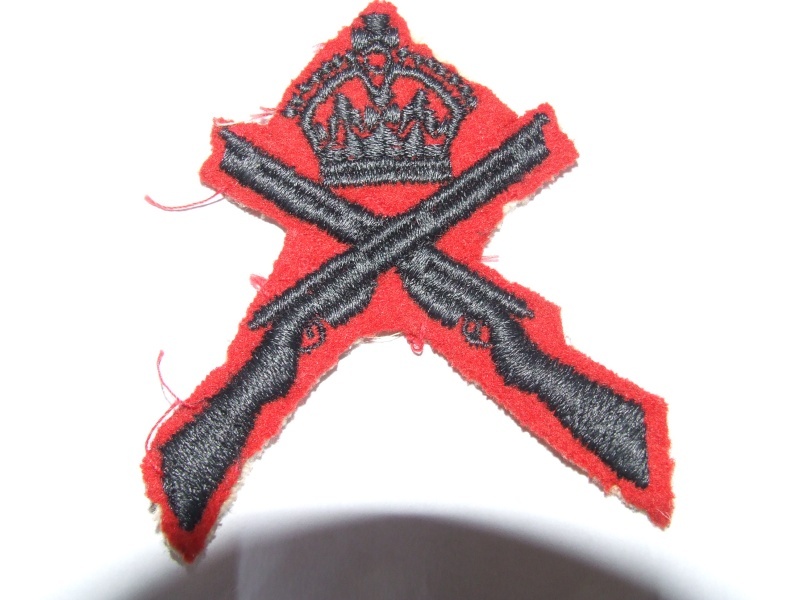 This isn't the 'prize' badge but rather a badge that was awarded to all who qualified as a MArksman. Another version exists (existed) without the crown. Quoting Dressed To Kill, pg 66-67, it is identified as a prize badge for best shot Platoon Sgts and section commanders. Similarly, Edwards and Langley, British Army Proficiency Badges identify it as a prize badge for best shot, for senior NCO's, page 34. Bennet, in Skill at Arms indicates the crown version was introduced sometime after the Second World War. The badge is not listed in the CMHQ chart of approved badges, nor is it listed in the Priced List of Stores, RO 1862. I believe you are correct in the post war description as the badge was used to for marksmen and first class marksmen. These were respectively cross rifles and crown and cross rifles. (As opposed to happy rifles.) Prior to that, it appears the badge was a "prize" badge. Bill wrote: uoting Dressed To Kill, pg 66-67, it is identified as a prize badge for best shot Platoon Sgts and section commanders. Similarly, Edwards and Langley, British Army Proficiency Badges identify it as a prize badge for best shot, for senior NCO's, page 34. Bennet, in Skill at Arms indicates the crown version was introduced sometime after the Second World War. The badge is not listed in the chart of CMHQ chart of approved badges, nor is it listed in the Priced List of Stores, RO 1862. Good point Bill and my mind was more on postwar than wartime. I will have to check my files to see how these were awarded during the First World War (not suggesting this badge dates from then, but rather for my own interest). 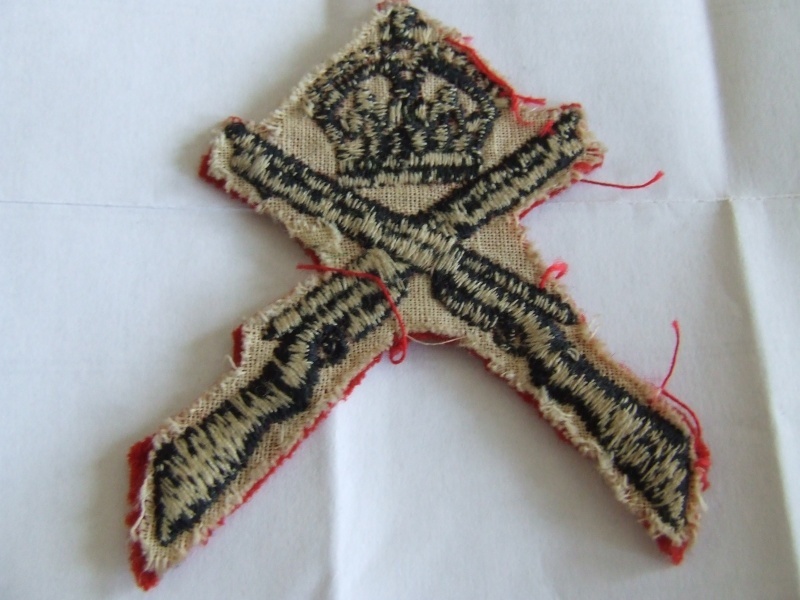 This badge, either cross rifles and crown or cross rifles dates to the pre-1914 militia as well. Langley & Edwards indicate it is the oldest British proficiency badge, and as Canada followed British practices, the badge should have been awarded to the militia.